Welcome to the Zoophobia Comic Forum! Here's a little guide to help you get started! I know it looks long, but most of that is demonstrative pictures, so please read the whole thing. First of all, the format. 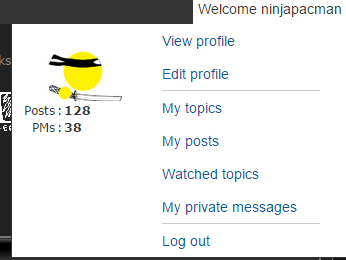 Like most other forums, you have a set of icons you can use to navigate at the top. 1. The yellow apple labelled Home will take you to the front page of the forum. 2. The hourglass labelled Calendar takes you to a calendar where you can mark important dates, such as member birthdays. Click either of the bubbles to search for a specific Post or Topic, and type in the Subject of the post or topic you wish to find. 5. The Users icon navigates you to the Userlist where you can find users by Last Visit, Name, Number of Posts, or multiple other helpful sorting options. Right now there are only a few groups, but in here you can join them, see a list of group members, or even start a new one! 7. The Profile icon allows you to edit and update your profile, so it's where you can go to personalize. 8. The icon that says No Mail will light up Yellow and look like a letter when you have an unread PM. 9. Last but not least is the Log Out button. You can turn off notifications if you click See all notifications at the bottom. 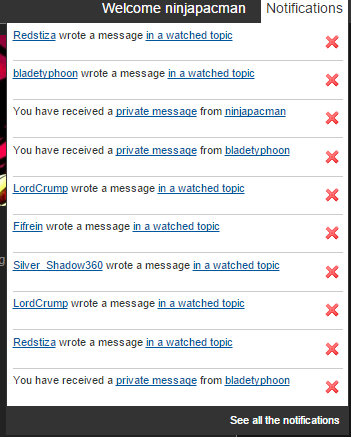 As for the actual forum, there are 3 Sections. What's new, which contains news and comic updates. Community, which contains all the main sub-sections you will be visiting and posting in. And Miscellaneous, which contains the Help sub-section and forum feedback. Each Forum sub-section has a couple parts. 1. The name of the sub-section and what it's for. 2. What groups can moderate topics in the Sub-Section. 3. The amount of topics in the sub-section. 4. The total number of posts in the sub-section. 5. The name of the last topic that was replied to in the sub-section. 6. The time and date of the last reply. 7. The name of the user who made the reply. 8. The star will be filled in when there is an new unread topic in the sub-section. A reply button will be added next to it if you are inside a Topic. Click on that button to create a reply to the topic. You can also click on any of the section/topic names next to the buttons to be instantly transported to those sections or topics. 1. Quote allows you to "Quote" the other person's reply in your own, so you can draw attention to what a specific user said. 2. Edit brings you back to the post creator screen, where you can freely edit your post. 3. Delete will remove the post. You can only delete your own posts. 4. Multiquote is highlighted when you click it. It works like quote, but if you click it for multiple posts, you will have all of them in your next reply. 5. View IP address is the last small circle icon. It does exactly that, and is otherwise useless. 1. Profile will take you to the profile of the user who made the post. 2. PM will take you to the Private message creator so you can send a private message to the user who made the post. 3. The Yellow circle shows that the user who made the post is online. If the circle is not there, the user is offline. With this, you should have plenty of info to make your own introduction post. Simply make a new post, Title it whatever you want, and tell us about yourself. What are your likes and dislikes, how did you get into Zoophobia, and nice information like that. » Seeds started - what now?